RadioFreeLiberal.com • View topic - Donald Trump's Shocking Easter Tweet! Donald Trump's Shocking Easter Tweet! Post subject: Donald Trump's Shocking Easter Tweet! You won't believe what he has to say next. 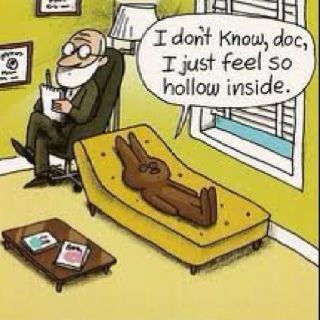 Post subject: Re: Donald Trump's Shocking Easter Tweet! "These big flows of people are all trying to take advantage of DACA. They want in on the act!" "Mexico is doing very little, if not NOTHING, at stopping people from flowing into Mexico through their Southern Border, and then into the U.S. They laugh at our dumb immigration laws. They must stop the big drug and people flows, or I will stop their cash cow, NAFTA. NEED WALL!" "Border Patrol Agents are not allowed to properly do their job at the Border because of ridiculous liberal (Democrat) laws like Catch & Release. Getting more dangerous. “Caravans” coming. Republicans must go to Nuclear Option to pass tough laws NOW. NO MORE DACA DEAL!" So, the weird thing is, I posted that, figuring the one day he might refrain from tweeting (well, other than the perfunctory "Happy Easter") was today. Of course, as usual, Trump is unpredictable. Like him actually going to church! Professor X rickrolls us! Sad! That means he'll wear a bell to warn people that he's coming their way. Had to add one of those Easter Bunny photos from today. 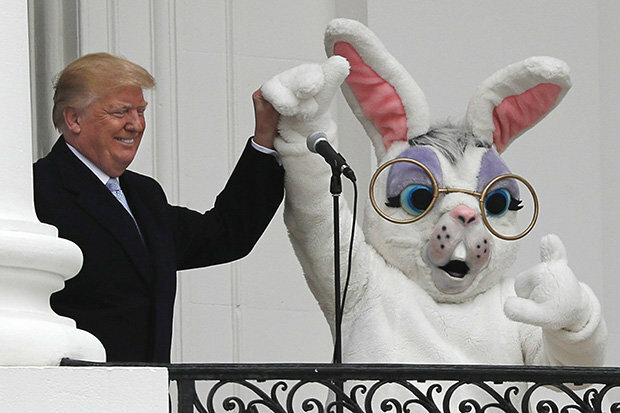 He sat there, standing next to the Easter Bunny, talking to kindergarten kids who were there to hunt Easter eggs, about how great the economy and the military are doing. As Bugs Bunny would say: "What a maroon". "Ladies and gentlemen ... the next Secretary of the Interior!"